It’s midmorning at the University and Jepson Herbaria, and Kim Kersh is pulling specimens from the freezer. There are five boxes total, varying in size and shape. Wrapped around each are strands of red string, tied like shoelaces. 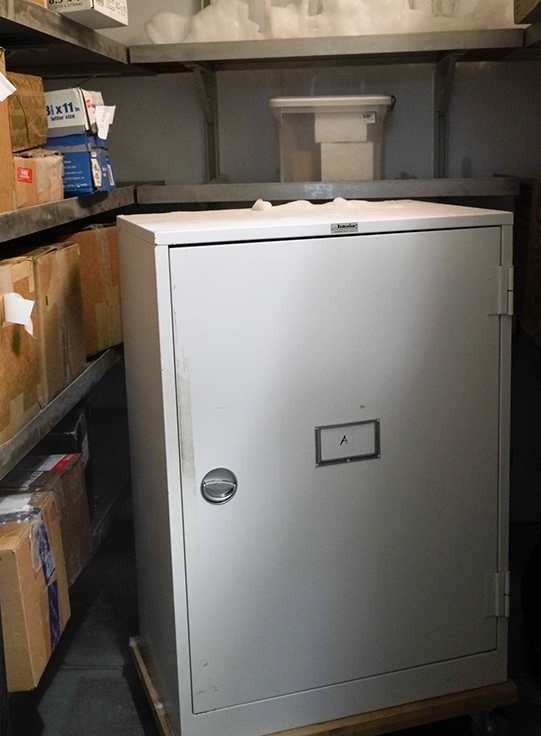 This freezer, located at the facility that houses UC Berkeley’s extensive collection of pressed plants, looks pretty standard, but, at negative 30 degrees celsius, the temperature inside is closer to the Arctic in January than it is to the top compartment of a home fridge, which is better suited for storing pints of Rocky Road. 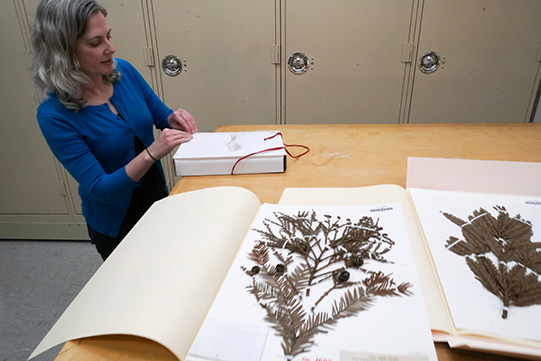 Soon, the five boxes, containing plant specimens — pulled from the collection of 2.2 million — will be transported from here, the ground floor of the Valley Life Sciences Building, to The Bancroft Library, where they will become part of a new exhibit. 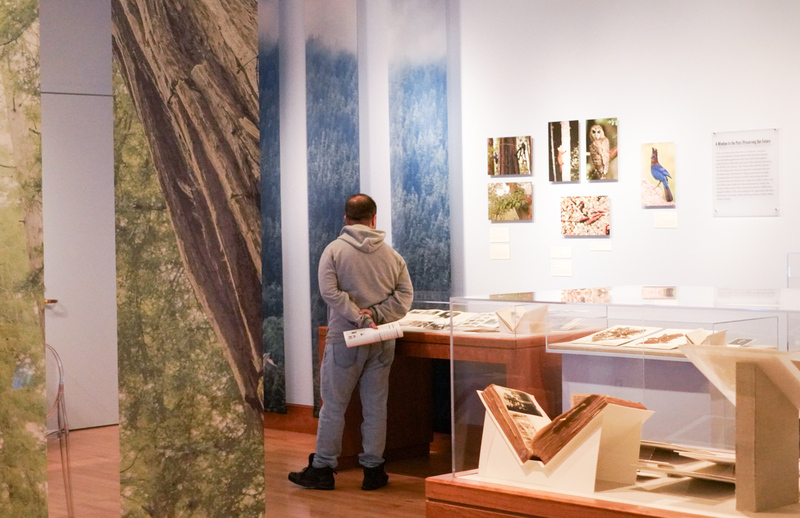 The exhibit, called Sustaining Grandeur, provides a glimpse into Bancroft’s vast record of the environmental movement — a collection of materials that is among the largest of its kind in the nation. 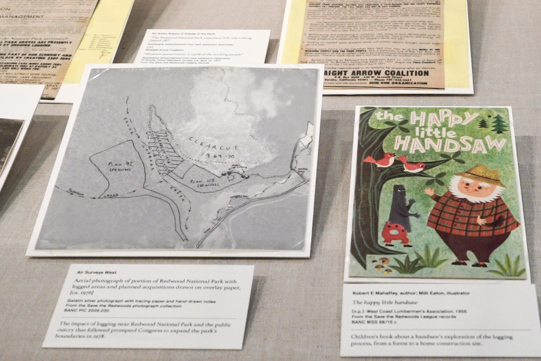 The show commemorates a century of preservation by Save the Redwoods League, featuring items from the League’s own archive, held by Bancroft, as well as other treasures. The treasures, on display in the Bancroft Gallery through Sept. 14, run the historical gamut and include a hand-drawn map by celebrated naturalist John Muir; a letter to the League from President Barack Obama, with a photo of his family; and correspondence from Stephen Mather, the first director of the National Park Service, to John C. Merriam, one of the League’s founders. Around the herbarium, and beyond, Willis Linn Jepson is kind of a big deal. He was involved with Save the Redwoods League, dating back to its earliest days, and he’s the namesake of the herbarium, whose materials include specimens collected by the man himself. Some of Jepson’s specimens will be on display in Sustaining Grandeur, including samples from 1903 of coastal redwood heartwood, sapwood, and bark, carefully labeled, which Jepson obtained from a visit to a lumber company in Fort Bragg, as well as a sample from 1906 of a redwood at Mill Creek. Before the specimens can take an extended stay at the Library, they spend a week in the freezer to stave off the threat of insects. 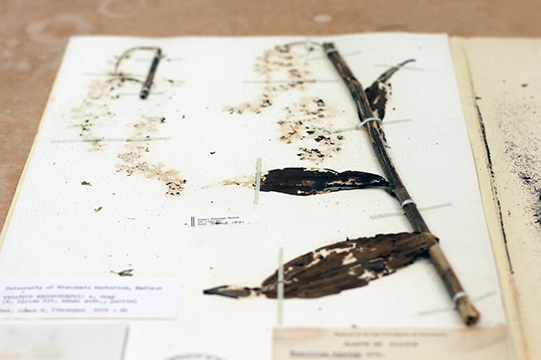 Exposing the materials to such low temperatures helps prevent bugs — namely drugstore and herbarium beetles, but also booklice and silverfish — from hitching a ride into Bancroft, munching on its collections, and turning the materials into “frass,” as Kersh politely calls the bugs’ excrement. “(Bancroft’s) material is susceptible, but not to the extent ours is, because the plant material is really tasty,” Kersh explained. 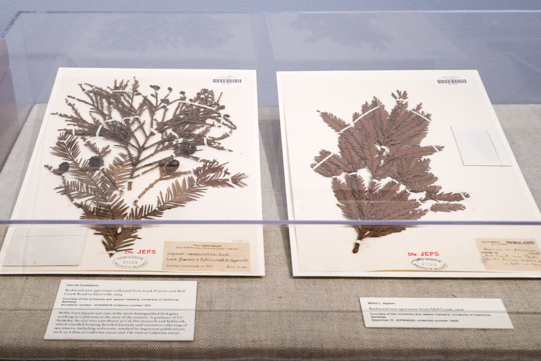 Once they’re slowly brought up to room temperature, to prevent condensation — and possible water damage — the specimens from the herbaria will join the bevy of photographs, documents, correspondence, and other treasures dispersed throughout the exhibit, which explores the history of the League and looks ahead to the organization’s continuing preservation efforts. 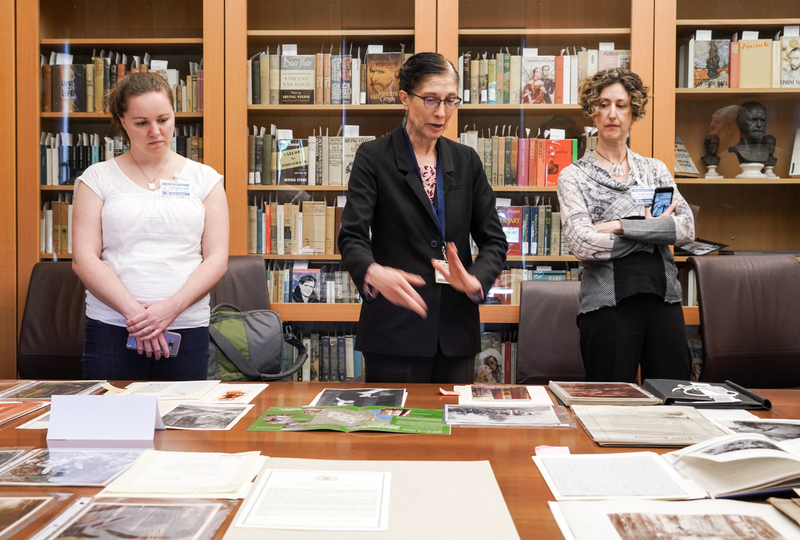 Theresa Salazar, center, The Bancroft Library’s curator for Western Americana, looks over items being considered for the Sustaining Grandeur exhibit with guests in March. The League’s tradition of collaboration dates back to its earliest years. An extension of the garden clubs that came about in the latter part of the 1800s, women’s clubs began to form around the same time the League was born, taking on the cause of preservation. These groups would become some of the League’s first collaborators. Included in the exhibit is a handwritten roster of members of the Women’s Save the Redwoods League of Humboldt County, a group that was independent from the League but shared its goal of preservation. The group served as eyes and ears on the ground, sounding alarms about the threats to the redwoods and lobbying local powers to help save the trees. The materials in the exhibit, divided into seven themed sections, represent a variety of perspectives, from politicians to conservationists to the logging industry. 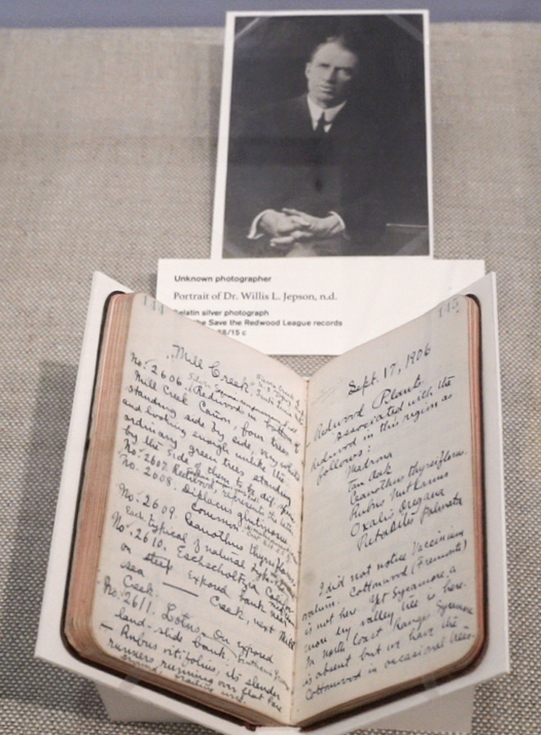 Top to bottom: Clockwise from left: Items from the University and Jepson Herbaria include a Willis Jepson field notebook and two redwood specimens that were frozen in preparation; the exhibit also includes documents, photographs and a children's book called The Happy Little Handsaw. The lumber section, for example, includes field notes from Jepson; a booklet from the California Redwood Association on the uses of the wood, which range from cigar boxes to caskets; and a 1950s children’s book, called The Happy Little Handsaw, published by the West Coast Lumbermen’s Association, which describes the logging process in a kid-friendly way. “(The book) is kind of a novelty, but it does show that there are whole industries or communities that have an entirely different perspective of what the conservationists were promoting,” said Andy Lynch, a San Francisco-based freelance researcher who has worked with the League for the past year and a half, and helped with the exhibit. One treasure Salazar finds especially compelling is from the travel and promotion section. It’s a diary from 14-year-old Caroline LeConte, daughter of the scientist, early conservationist, and UC Berkeley professor Joseph LeConte. The entry featured in the exhibit, which is written in Caroline’s neat cursive — and includes a drawing by the teen — recounts a trip to the Sierra Nevada in the 1880s. Sprinkled throughout the exhibit are appearances by American presidents. (In fact, seven current or would-be presidents are included in the show.) In addition to the letter from Obama, the exhibit also includes the pen Lyndon B. Johnson used to sign the final bill forming Redwood National Park, as well as a signed typewritten letter by John F. Kennedy, endorsing the Hammarskjold Grove, named in honor of the secretary general of the United Nations, who had recently died. The letter is dated Nov. 9, 1963 — shy of two weeks before Kennedy’s own death. A visitor looks at items in the Sustaining Grandeur exhibit on Saturday. Spanning the League’s rich 100-year history, the show is packed with gems. But what is Salazar’s favorite part of the exhibit? Want to explore the libraries on Cal Day? Here's a guide.